Choosing a font isn't always difficult, but it can be more time-consuming than necessary. That's because most apps don't let you view fonts side-by-side, so if you want to compare your options, your only choice is to manually make the change. And then, of course, you have to remember exactly what your previous options looked like, and what those fonts were called. A font manager like FontViewOK (free) can make this process a whole lot simpler. FontViewOK lets you see how your text will look in 213 different fonts, but doesn't let you narrow the list to compare just two or three options. This free app lets you view your text in a variety of fonts, side-by-side, so you can see which one best fits your needs. All of FontViewOK's options are clearly labeled, so you don't have to worry about remembering any font names. FontViewOK is a small executable that you run whenever you'd like to use the app--no installation needed. That means it's portable: you can load the file on a USB drive and use it on any Windows-based PC. Its creator, SoftwareOK, boasts that the app is so easy to use that you won't need a help file...so they haven't included one. I'll agree that the app is easy to use: you simply enter your text in the form at the top of the app, and FontViewOK automatically shows you how it will look in 213 different fonts. But I'd still like a help file, as the app does have a few limitations that could be explained more clearly. For one, you can't search for a certain font; you have to find its name in the drop-down list provided at the top of FontViewOK's window. 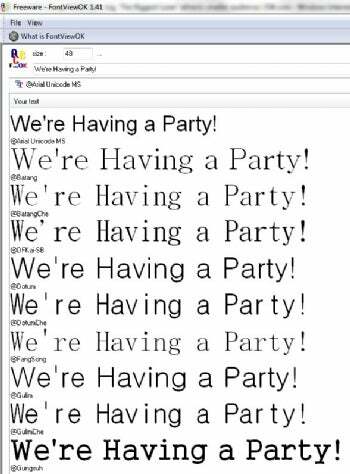 If you're browsing through 213 options, finding a specific font can take some time, but, then, so can browsing through all of the available fonts in an application like Microsoft Word. Also, I wish the app let you view just two or three font options at once; as it stands now, you can only scroll through all of the fonts available to see how they look. While this gives you plenty of options to choose from, the result can be overwhelming. It would be nice if you could eliminate the options you know you don't want. These quibbles are minor, though. If you're creating a visual document, such as an invitation or a newsletter, FontViewOK can make it easy to find the best font for the job.